There is a lot of chatter on the ole’ interweb about Heath Ledger’s death and how it will play into how Warner Brothers can and will market the upcoming Batman film THE DARK NIGHT. No two opinions are the same and everywhere you look people are taking steps to remove Joker references from promotional materials. I have thought a bunch about this because I have made it my mission to solve this little quandary…….and I have. The solution is simple……do nothing. Yep. 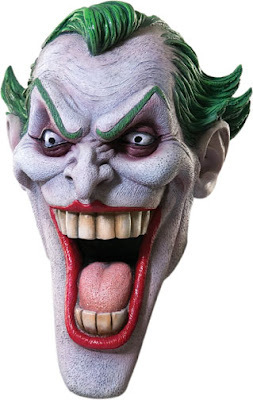 Treat the character of the Joker exactly as he is, a fictional character. Now before you get all in a tizzy let me explain. Yes I think it is sad that Heath Ledger is dead but at the same time I would hate to see the vision of this film changed because they are afraid to use his image in a movie poster. At this point there is nothing WB can do to bring Heath back from the dead so whatever was planned should continue. Treat the Joker as the Joker and not the person who played him. The type of people who are going to see this ONLY because it is his last film will still see it so there is no need to play into them or their wishes. So instead of pandering why not create some movie marketing magic and just keep on keeping on. Before Ledger’s passing this film was on track with some really innovative marketing campaigns. I say keep them coming and if it fits to use the Joker then use the Joker. Movies are about magic and for this movie not to become a carnival sideshow WB needs to keep with the Magic so that people want to see this film so they can be taken to another place and time……and not a memorial service. I’m sorry Saul but it will take the studios at least six meetings in cities around the globe (where ever there are expensive resorts) at a cost of hundreds of thousands of dollars to come up with the same decision. You simply cannot upset the delicate balance west coast marketing genius by stating the obvious. These things need to be decided over a longer period of time at much great expense. And no you won’t be able to say I told you so because we’ll likely add a full page ad somewhere to mourn Heath’s passing while also promoting the movie and you didn’t think of that…someone else also not associated with the studio thought of that.